known just as much for its amazing waffles as for its unique business model: all the profits from the café go to specific ministries, such as free housing for missionaries. It is a Christian business, but every Sunday they hold discussions on a broad range of topics, and people of all faiths are invited to attend. Three friends and I attended a discussion on identity. Another man there had been a missionary in Cusco since the 70’s. Throughout the discussion, he referenced a number of great literary works he found relevant. At the end, he gave each person a three-page handout filled with his all­-time favorite quotes–a true treasure. heard of it until I was thumbing through the handout looking for a cool quote to use on Instagram to caption a shot I took at Lake Titicaca. I came across this quote by Helen Keller and loved it immediately. Yes, I loved it for its profundity and because it sounded appropriate for what my picture was portraying. However, I also loved it because it articulated thoughts I had been hesitant to put into words myself. When I saw that the Helen Keller had said this, I felt a sense of freedom and validation. Christian Movement”. One of the many things I learned is that the life of a true follower of Jesus is necessarily marked by adventure. When I went off to college for the first time, I was further convinced of this. The funny thing is that it took me going on the biggest adventure of my life, study abroad in Peru, for me to doubt this. Thoughts started creeping into my head. I thought that maybe I was striving for a life of adventure over a life of God—trying to be someone I was not. I thought it possible to be passionate about Jesus and never expect wondrous things to happen. Then, I learned in Spanish that this reflexive form of the verb “ir” is usually used when a destination is not specified. And then came this quote. There is one single word that comes to mind when I think about describing this semester abroad in Peru. You guessed it–adventure. Adventure manifested in learning a new language, in travelling to places I did not know existed, in seeing sights I had only ever heard or studied about, in meeting people from all over the world, in having challenging talks, in trying new (and sometimes unpalatable) foods, in dealing with strange illnesses, in being a sister to Peruvian kids I had known for only three hours, in being hugged by 26 kids more passionately than I thought possible, in travelling on a bus for 23 hours, and in learning more about the grace and power God gives us if we are willing to put forth even the smallest amount of faith. Chachacomayoc Primary School, to the girls at Casa de Acogida, and to the beautiful Peruvians on the streets in ways that will bring Him the utmost glory. I feel confident knowing that any work I have taken part in Peru was done with love as the motivation. 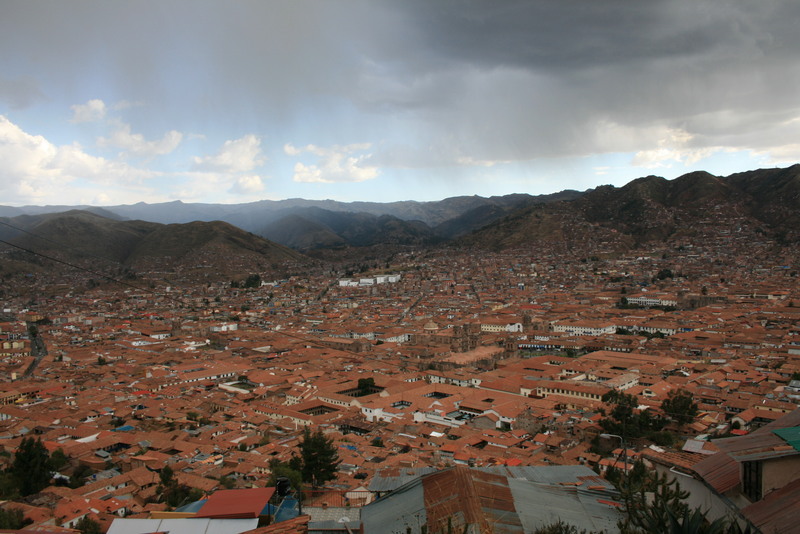 telling an eleven-­year-­old girl from Lauramarca the truth about who God is. She asked the most amazing questions and I was happy to use Spanish to explain the beauty of the love of God. I told her that God does not only speak English and Spanish, but every language. I told her to speak to Him in Quechua because he understands her. I learned that the misconceptions of Christianity may need to be debunked when witnessing to another culture. Finally, Juan Carlos taught us how to study and apply the Bible in culturally ­sensitive ways. anything to do with an indescribable, all-­powerful being that we humans call God, yet I am still choosing to boldly approach him and claim daughtership. And with that, I accept the duties and responsibilities that come with claiming to know the Creator God as my Dad. I agree, Helen, security is mostly a superstition. We start to approach security as we draw near to the Father. However, in drawing near we are reminded of who God really is and the illusion of security is overtaken by the reality of the adventurous, powerful nature of a life lived in obedience to God. Natalie Bain is a Junior Biology major and Nutrition minor at Point Loma Nazarene University in San Diego, California. Originally from Reno, Nevada, Natalie loves the outdoors and spending time with people outdoors. She’s a pre-med student who took a break from the science lab to spend a semester in Peru—and could not be more happy she did! Step out of your comfort zone and into a life-changing experience with Veritas Christian Study Abroad. It’s worth the risk. Get more info today.